Gold Mind Records was subsidiary of Salsoul Records, run by legendary Philadelphia guitarist, songwriter, arranger and producer, Norman Harris. Norman was responsible for running the label, discovering the talent and with some of his Philly friends, writing, recording and producing these acts. Loleatta Holloway, First Choice and Double Exposure are just a trio of the acts that Norman brought to Gold Mind. In 1978, Norman’s new signing were Love Committee, who back in the sixties, were called The Ethics. Twelve years after The Ethics released their debut single for Vent Records, Think About Tomorrow, The Ethics had a new name, and a new lineup. 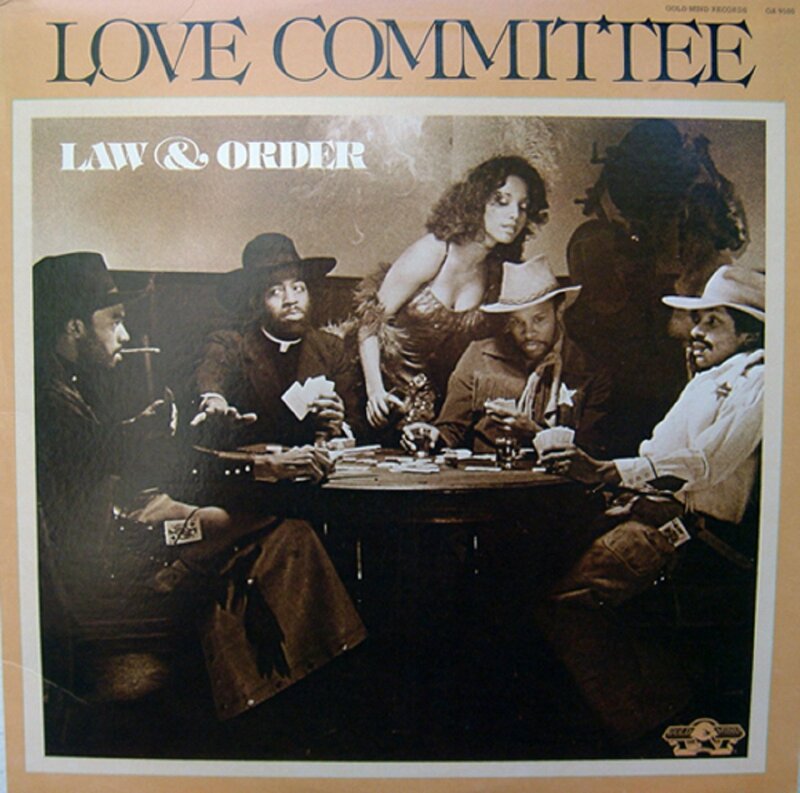 Now called Love Committee, they would release their debut album Law and Order on Norman Harris’ Gold Mind Records. Before I tell you about the music on Law and Order, which was rereleased recently by BBR Records, I’ll tell you about Love Committee’s musical journey. Love Committee were one of many Philadelphia soul groups formed in the sixties. Their original lineup featured Larry Richardson, Joe Freeman, Norman Frazier and future-Temptation Ron Tyson. Later, Michael Bell replaced Larry Richardson. This was the lineup that recorded their debut single Think About Tomorrow. It had just been released on Vent Records. However, a week after the release of Think About Tomorrow, The Ethics had a massive argument. This resulted in The Ethics losing several band members. That ironically, proved to be a blessing in disguise. Ron Tyson had been hearing about a talented, Philly-based singer Joe Freeman. Joe was from a deeply religious family, who frowned upon Joe singing secular music. However, Joe couldn’t resist the lure of the music industry. He agreed to join the latest lineup of The Ethics. Still The Ethics needed two new members. Asked if he new anyone who could join The Ethics, Joe recommended Carl “Nugie” Enlow and Andrew “Bike” Collins. Now that Ethics had a new lineup, their career could resume. With a new lineup, The Ethics released further singles on Vent . This includes 1969s Standing In the Darkness and Farewell. After leaving Vent, The Ethics signed to Lost Night Records, which for a short time, they called home. After this, The Ethics met Thom Bell. He took The Ethics under his wing, and even wrote a song with Ron Tyson. This came to an abrupt end after The Ethics’ management asked Thom Bell for a slice of the publishing. That didn’t happen. Instead, Thom Bell hooked up with The Stylistics, rather than deal with The Ethics’ management. Having parted company with one of The Mighty Three, The Ethics signed with the other two members of The Mighty Three, Gamble and Huff. Losing the opportunity to work with Thom Bell was a blow. Then Gamble and Huff signed The Ethics to Philadelphia International Records. They recorded the Bunny Sigler song Lover’s Anthem. Not long after this, The Ethics came across Thom Bell again. He seemed to have forgotten their earlier disagreement, by recording Lean On Me, which Thom and Linda Creed cowrote. Kenny Gamble decided the song wouldn’t be released. After all, Bill Withers was about to release a version the week before The Ethics’ version. He didn’t want The Ethics and Bill Withers going head to head. Not long after this, The Ethics left Philadelphia International Records and joined Golden Fleece Records. Next stop for The Ethics, was Baker, Harris, Young’s newly formed label Golden Fleece Records. It was financed by Philadelphia International Records, who sometimes, sent artists to Golden Fleece. This was the case with The Ethics, who released Good Luck in 1974. Then, just as things started to improve for The Ethics, they pressed the self-destruct button again. Another disagreement about the future direction of The Ethics, lead to Carl Enlow and Andrew Collins leaving the group. Quickly, Ron Tyson and Joe Freeman replaced them with Larry Richardson and Norman Frazier. Larry was related to Ron, while Norman was originally from Washington D.C. Just as Ron and Joe thought The Ethics were making progress, things got even worse. Thaddeus Wales, who owned Wale Records, claimed ownership of The Ethics’ name. Having established The Ethics’ as a group, it was snatched away from them. Larry and Joe decided the easiest thing was to change the group’s name. So, The Ethics changed their name to Love Committee. The newly formed Love Committee released just one single, One Day Of Peace on Golden Fleece Records. It wasn’t a commercial success. Shortly after, in 1975, Golden Fleece’s deal with Philadelphia International Records was about to expire. So, Gamble and Huff brought Love Committee back to Philadelphia International Records’ newly created subsidiary, T.S.O.P. At T.S.O.P Love Committee released just one single, Darling Come Back Home, which failed commercially. Not long after this, Love Committee were dropped by T.S.O.P. While commercial success continued to elude Love Committee, record companies realised Love Committee had potential. This included German label Ariola. They signed Love Committee to their Beverley Hills imprint. Four songs were recorded, but still, commercial success eluded them. There was nothing wrong with the songs, far from it. What they needed was to work with the right people, people who could bring out the best in Love Committee. This just happened to be Baker, Harris, Young and their Philly friends. One day, Norman Harris came across Larry Richardson, who he new from way back. When Norman heard that Love Committee were without a label, he recommended them to the Cayres, who owned Salsoul and Gold Mind Records, which Norman ran for them. The Cayres liked what they heard, and signed Love Committee to Gold Mind Records. Soon, work began on Law and Order, Love Committee’s debut album. Norman Harris cowrote four tracks with Allan Felder and Love Committee lead singer, Ron Tyson. They were the title-track Law and Order, If You Change Your Mind, Pass the Buck and Give Her Love. Ron Tyson cowrote Tired of Being Your Fool with Eddie Moore, and Cheaters Never Win with Allan Felder and T.G. Conway. T.G. Conway, Bruce Gray and Ron cowrote Just As Long As I Got You, while Bruce Gray, Bruce Hawkes and Ron cowrote Put It In the Back of Your Mind. These tracks would become Law and Order, which was recorded at Philly’s Sigma Sound Studios. When Love Committee set about recording Law and Order, they were accompanied by some of Philly’s finest musicians and backing vocalists. The Salsoul Orchestra’s rhythm section came courtesy of Baker, Harris, Young, helped along by bassist Jimmy Williams and drummer Keith Benson. Guitarists included Bobby “Electronic” Eli, Eddie Moore, T.J. Tindall and Roland Chambers. Keyboardists included Ron “Have Mercy” Kersey, Cotton Kent, Bruce Hawkes, Bruce Grey and T.G. Conway. They were joined by Larry Washington on congas and percussionists Allan Felder and Ron Tyson. Don Renaldo supplied the strings and horns, while The Sweethearts of Sigma, Evette Benton, Carla Benson and Barbara Ingram added backing vocalists. Ex-Temptation Ron Tyson sang lead vocals, but like his former group, The Temptations, the lead vocal changed hands. Eight tracks were recorded, with a variety of production teams, including Baker, Harris, Young, Allan Felder, Ron Tyson and Norman Harris producing Law and Order. Once Law and Order was recorded, it was ready for release in 1978. When Law and Order was released in July 1978, the album failed to chart. Cheaters Never Won reached number fifty-seven in the US R&B Charts in November 1977. The title-track Law and Order was released in June 1978, reaching number twenty-one in the US Dance Music/Club Play Charts and ninety-seven in the US R&B Charts. Tired Of Being Your Fool was the final single. Released in September 1978, it failed to chart. Considering the quality of music, plus the personnel involved in making Law and Order, this must have come as a crushing blow to everyone concerned, especially, Love Committee. You’ll realise this, when I tell you about the music on Law and Order. Opening Law and Order is the title-track Law and Order, penned and produced by Allan Felder, Ron Tyson and Norman Harris. Bobby “Electronic” Eli’s searing guitar, lush, dancing strings and a pounding, powerful and sometimes, funky Baker, Harris, Young rhythm section create a dramatic backdrop. Blazing horns, percussion and keyboards combine before the tightest, soulful harmonies give way to Ron’s powerful, vampish lead vocal. He delivers lyrics filled with cutting, social comment with sheer passion. Soon, the lead switches hands, a soaring falsetto the perfect replacement, responding to Ron’s call. Harmonies, frantic strings and Baker, Harris, Young ensuring the song swings along. Ron Baker gives a masterclass on bass. His pounding bass and Earl Young’s drums, help drive an arrangement that’s a mass of cascading strings, sizzling guitars, and the soulful, soaring harmonies along. It’s a perfect way to open Law and Order. Uptempo, full of hooks and bursting with energy and social comment. You’re left wanting to hear more, much, much more. The tempo drops on the Ron Tyson and Eddie Moore penned Tired of Being Your Fool. Produced by Ron Tyson and arranged by Ron “Have Mercy” Kersey, it’s a beautiful, soulful track, where Ron lays bare his weary soul. Quivering strings, burst of a wistful horns and Norman Harris’ pensive, jazz-tinged guitar combine with Ron emotive, soaring vocal. Soon, the drama and emotion increases. Baker, Harris, Young, swathes of strings and broody horns provide a backdrop that reflects this. Ron’s vocal is filled with sadness and regret, while the Sweethearts of Sigma and the rest of Love Committee add soulful, truly heartfelt harmonies. They’re the perfect accompaniment to Ron’s impassioned pleas, as he lays bare his soul for all to hear. If You Change Your Mind is the second of the tracks written and produced by Allan Felder, Ron Tyson and Norman Harris. Jack Faith arranges what is a string laden ballad, with cooing harmonies from the Sweethearts of Sigma. Ron’s half-spoked, heartbroken vocal is answered by a falsetto that brings to life the sadness and heartache in the vocal. Slow, sad strings, a thoughtful Baker, Harris, Young, complete with Ron Baker’s pensive bass and Norman Harris’ pensive guitar. Layers of strings cascade, joining the cooing Sweethearts of Sigma while horns rasp as the vocal sees optimism and hope mixed with heartache and hurt. The result is one of the most beautiful tracks on Law and Order. Cheaters Never Win see Baker, Harris, Young produce a track, that from the opening bars has Baker, Harris, Young’s name all over it. Shimmering strings, wistful, rasping horns and Norman Harris’ chiming guitar open the track, before it reveals its secrets. At the heart of the action are the Baker, Harris, Young rhythm section providing a pulsating, sometimes, pounding, dramatic heartbeat. Ron’s vocal is full of despair and frustration, with the Sweethearts of Sigma and the rest of Love Committee adding heartfelt, soulful harmonies. Add in the swathes of swirling strings, chiming guitars and Ron’s despair filled vocal and this brings this epic fusion of emotion and drama to a heartbreaking close. Pass the Buck opens Law and Order and is another Baker, Harris, Young production, arranged by Ron “Have Mercy” Kersey. The track bursts into life, Ron’s powerful, vampish vocal accompanied by sweeping, swirling strings, a funky Baker, Harris, Young rhythm section and growling horns. With a burst of Earl Young’s drums and flourishes of piano, Ron delivers a vocal filled with searing social comment, about unfairness, poverty and injustice. Dramatic harmonies from the other members of Love Committee and the Sweethearts of Sigma prove the perfect foil for Ron’s angry, frustrated vampish vocal, Baker, Harris, Young join frantic strings and grizzled horns in providing the backdrop for one of Ron’s best vocals on Law and Order, where his vocal mixes anger, frustration and social comment, but with a real swing. Put It In the Back of Your Mind was produced by Ron Tyson and arranged by Jack Faith. Swathes of strings, rasping horns, piano and a jazzy Baker, Harris, Young rhythm section build up the drama and emotion for an impassioned falsetto. Soon, Ron takes over the vocal, mixing power and passion. Harmonies from the Sweethearts of Sigma and Love Committee sweep in, and are delivered with a jazzy swing. The interplay between the lead vocal and harmonies are filled emotion and drama, while the big band style arrangement complete with rasping horns, swirling strings and punchy harmonies. They’re just the finishing touch to this uptempo slice of old time jazzy music. Give Her Love is the third and final track written and produced by Allan Felder, Ron Tyson and Norman Harris, who arranges the track. The tempo drops way down, as Ron delivers one of his most moving vocals. Just a slow, considerate Baker, Harris, Young rhythm section, cooing harmonies from the Sweethearts of Sigma and Love Committee and lush strings build the drama, beauty and emotion. So when Ron’s vocal enters, he’s the perfect backdrop to lay bare his soul and feelings. Norman Harris’ chiming guitar, lush strings and wistful horns join harmonies, as Ron delivers a heartfelt, impassioned vocal. As the emotion in his voice grows, so does the drama in the arrangement. Ron emotively vamps his way through the track, resulting in a heartbreakingly beautiful song. Closing Law and Order is Just As Long As I Got You, produced by Baker, Harris, Young. Written by Bruce Hawkes, Ron Tyson and T.G. Conway, this allows Love Committee to close Law and Order on a real high. The tempo increases and hooks are plentiful. Larry Washington’s congas, a pounding Baker, Harris, Young rhythm section, blazing horns, sweeping strings and a flourish of keyboards give way to tight, soulful harmonies. Ron’s vocal is a mixture of tenderness, power and passion. Soon, the vocal changes hands, with the falsetto taking charge. Norman Harris’ guitar, bursts of horns, swirling strings and dramatic flourishes of Earl Young’s drums combine, setting Love Committee up for a big finish. With the baton passed, they do their part Ron’s lead and the harmonies pushing the other to greater heights of hook laden, soulfulness. That Love Committee’s debut album Law and Order wasn’t a much bigger commercial success, almost seems unjust. It’s one of these albums where you’re spellbound from the opening bars right through to the closing notes. Law and Order includes just eight songs, lasting forty minutes, where lead singer Ron Tyson, Michael Bell, Joe Freeman and Norman Frazier showcase their considerable vocal, and harmonic talents. Heartachingly beautiful, soul-baring ballads and hook-laden, uptempo tracks sit comfortably side by side. Mind you, given the personnel that played on Law and Order, this is no surprise. On Law and Order, Love Committee were accompanied by some of Philly’s greatest musicians. This included Baker, Harris, Young, Bobby “Electronic” Eli, Larry Washington and the legendary backing vocalists the Sweethearts of Sigma. Law and Order truly, featured a musical all-star cast. Arrangers like Ron “Have Mercy” Kersey, Bruce Hawkes and Jack Faith, plus producers like Baker, Harris, Young and the trio of Allan Felder, Ron Tyson and Norman Harris all played their part. That’s why Love Committee’s debut album Law and Order is such an accomplished album. Indeed, Law and Order is yet another of Philly Sou’s hidden gems. Not only that, but it’s one of the few albums released on Norman Harris’ Gold Mind Records not to be a commercial success. Maybe part of the problem with Law and Order’s lack of commercial success was Gold Mind Records were experiencing financial problems. Just a year later, Gold Mind had to be rescued by Salsoul Records and absorbed into Salsoul. Sadly, all Norman Harris’ hard work and genius was for nothing. Love Committee’s debut album Law and Order way not have been one of the most successful albums Norman Harris was involved in, but it shows just how talented Norman was as a musician, songwriter and producer. Similarly, Law and Order which was recently released by BBR Records, demonstrates just how talented Love Committee were. Given the quality of music on Law and Order, the album most definitely deserved to be a much bigger commercial success. Standout Tracks: Law and Order, If You Change Your Mind, Cheaters Never Win and Give Her Love. ← PEABO BRYSON AND ROBERTA FLACK-BORN TO LOVE.